Richard Reid, the al Qaeda follower who tried to blow up a trans-Atlantic jetliner with explosives hidden in his shoes, was sentenced to life in prison Thursday by a judge who warned him: "We are not afraid ... We are Americans. We have been through the fire before." The 29-year-old British citizen cried, "You will be judged by Allah!" before being dragged from the courtroom in handcuffs. Reid received the maximum sentence after declaring himself a soldier of war and denouncing U.S. foreign policy toward Islamic countries. "Your government has sponsored the torture of Muslims in Iraq, and Turkey, and Jordan and Syria with their money and weapons," said Reid, who converted to Islam eight years ago. U.S. District Judge William Young would have none of it. "We are not afraid of any of your terrorist co-conspirators, Mr. Reid," said the judge. "We are Americans. We have been through the fire before. "You are not an enemy combatant — you are a terrorist. You are not a soldier in any war — you are a terrorist. To call you a soldier gives you far too much stature. You are a terrorist and we do not negotiate with terrorists. We hunt them down one by one and bring them to justice." At that, the judge pointed to the American flag behind him and said: "You see that flag, Mr. Reid? That's the flag of the United States of America. That flag will fly there long after this is long forgotten." Reid had faced 60 years to life for trying to blow up an American Airlines flight bound from Paris to Miami just three months after the Sept. 11 attacks. Prosecutors said Reid had enough plastic explosives in his shoes to blow a hole in the fuselage and kill all 197 people aboard. Passengers and crew members overpowered Reid, using seat belts and their own belts to strap him to his seat. Two doctors aboard the flight injected him with sedatives and the jet was diverted to Boston. In sentencing Reid to the maximum penalty, CBSNews.com Legal Analyst Andrew Cohem said Judge Young "articulated the difference between the type of common criminal the system has dealt with since before the Declaration of Independence and the new hybrid breed of terror-criminal who commit crimes in the name of politics and religion." Cohen said, "The judge clearly got the message that even failed terrorist attacks like the one Reid orchestrated must be dealt with severely in this new age of terror threats. There is simply no room in the legal war on terror to cut admitted terrorists a single solitary break in sentencing." Federal prosecutor Gerard Leone Jr. told the judge that in Reid's mind "the religion of Islam justifies the killing of innocent civilians. In his mind, the horrific and homicidal attacks of Sept. 11 were but a missed opportunity." As Reid sought to justify his actions, several crew members who were on the flight looked stunned, glancing at each other in the courtroom and shaking their heads. One woman wept. In Washington, Attorney General John Ashcroft praised the sentence and called the passengers and crew heroes who averted a disaster. "The sentence imposed on Richard Reid says to the world that terrorists cannot escape American justice," Ashcroft said. "We will hunt them down, stop them and we will put them away." When Reid pleaded guilty last October, he said he was a member of al Qaeda, pledged his support to Osama bin Laden and declared himself an enemy of the United States. Prosecutors and the FBI said that witnesses reported Reid was present at al Qaeda training camps, and that Reid had help making the bomb from an al Qaeda bomb maker. Defense attorneys said Reid credits his religion with saving him from a life of drug use and despair. They described a troubled childhood and young adulthood, when Reid was plagued by poverty, racism and crime. In arguing for a life sentence, prosecutors this month submitted a videotaped simulation of what Reid might have accomplished, showing a fiery explosion causing severe damage to a wide-body jet. Reid tried furiously to light a match to his shoes but he was unable to ignite the fuse. 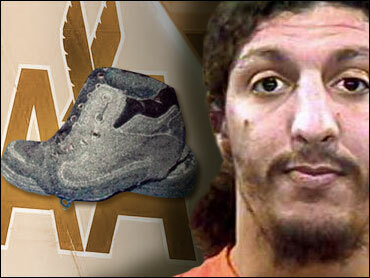 Authorities have speculated the shoes were moist from sweat. One of the flight attendants, Carole Nelson, pleaded with the judge Thursday for a life sentence. "I believe that Richard Reid was on a mission of evil, a mission of destruction and a mission of murder," she said. Federal authorities had been preparing for a high-security trial when Reid stunned prosecutors by pleading guilty in what he said was an effort to spare his family the pain and publicity of a trial. He pleaded guilty to eight charges, including attempted use of a weapon of mass destruction.